That was "an ice" surprise, not a nice surprise. Yesterday was definitely a day filled with the good, the bad, and the ugly. The good was having all these great musicians gathered here to spend a week recording a solo album written by my daughter May Erlewine Bernard. It started earlier this last Wednesday with preparations. Then May arrived on I believe Thursday (or was it Wednesday night? ), and she and my daughter Anne cooked up a storm. There were something like twelve bags of groceries that were carried in and the fridge was packed. They had to use Styrofoam coolers for the overflow. Thursday night Anne made a big vegetable stew punctuated with "Field Roast" Italian sausage, a vegan sausage that actually lives up to the name sausage. There is no soy-gibberish in it, and all ingredients are organic. I was (rightly) warned that I could sample one bowl. Otherwise I was to leave it alone. I did both of those things. We ate the stew Friday night as the gang gathered. And that afternoon and evening they were already working to set up for recording. Famed recording-engineer Ian Gorman was making all of this happen. You don't just walk in and record, at least not here. Gorman brought a van full of his own equipment to add to our own, and I mean a big van full. And so it went. In fact, it was all day Saturday, just getting ready. There were dozens of microphones, with scores of cords and wires running everywhere. The musicians each set up their own little niche and otherwise sat around practicing by themselves or working through new tunes with May. Lunch came with Anne bringing fresh cornbread and home-made chili to the studio. There was a vegan version and one with some organic beef. We all sat around a large conference table, took care of the food, and had fun. And the afternoon was ditto of the morning, still getting ready, and here comes the bad part. 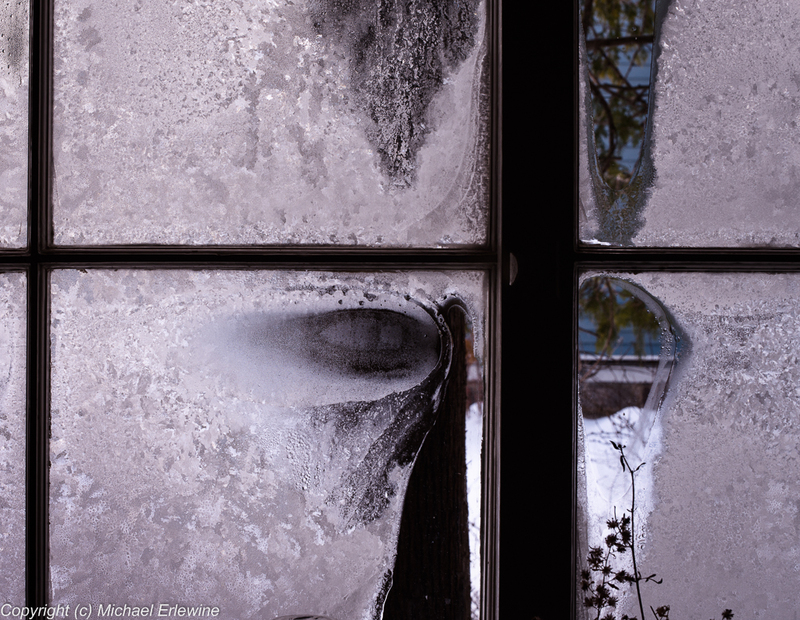 As I was staring through a crack in the venetian blinds from the studio at the empty building next door, where my software company used to reside, I saw what appeared like frost on the windows. I should photograph that, thought I. Then I looked at the white plastic exhaust pipe from the furnace for the building, and there was not even a vapor trail. Hmmm, this does not look good. It looks bad, and it was. As I unlocked and stepped into the vacant building it felt ice cold. There was no heat here. The news says the coldest arctic air in twenty years has been hitting us. I don't know about that, but our thermometer reached ten-degrees below zero the other morning, and that's cold. Anyway, somehow the furnace in the building had failed or been turned off. And now I get to the ugly part. The pipes were all frozen. The toilet was frozen solid. The pipes had burst in the kitchen and the water had run on and froze, finally forcing the doors on the sink cabinet open, and cascading ice out onto the floor. And it gets worse. Going down in the basement, under the kitchen, the entire basement wall was an ice cave, the walls, the floor, a workbench, outlets – the works. Well, after that it was a question of turning off the water main, and getting someone to get the furnace running. Our trusty handyman Anthony came to the rescue, got the furnace running, and all we could do is wait until morning to see what was to come of it. Meanwhile, back in the studio it was time for dinner, and we all trooped up to our house where Anne had made an Indian feast, with curried vegetables (Sabji), dahl, basmati rice, and all kinds of toppings. Everyone was hungry. As I write this, it is early Sunday morning. I have just returned from the ice house, and am happy to report that it is not going to be AS HORRIBLE as I thought. I picked up the ice from the floor that was now thawing and it will take time for the basement to not be an ice cave, but it is on its way. So, that's all the news that is fit to print. I understand that late last night they finished three songs and everyone will be right back at it today.